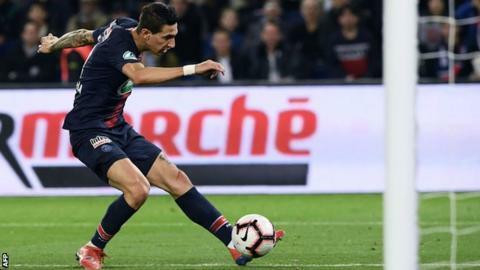 Paris St-Germain advanced into the semi-finals of the Coupe de France by beating Dijon at Parc des Princes. The French champions, who were without Kylian Mbappe and injured pair Neymar and Edinson Cavani, went ahead through Angel di Maria's delightful chip. The ex-Manchester United forward then doubled their lead midway through the first half before Thomas Meunier added a third late on. PSG are aiming to win the Coupe de France for the fifth consecutive year. Next up for Thomas Tuchel's side, who sit 17 points clear at the top of Ligue 1, is a trip to face Caen on Saturday. Then they host Ole Gunnar Solskjaer's United in the second leg of their Champions League last-16 tie next Wednesday, 6 March.